Traveller in the 3rd Dimension: Hot Spot 1: Drifters Dock Released! Hot Spot 1: Drifters Dock Released! Starships aren't built in a studio; they're forged in the Ironworks. 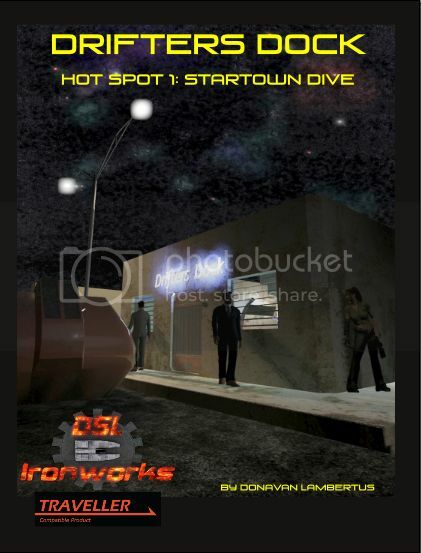 Welcome to Hot Spots, the latest release from DSL Ironworks. Hot Spots are designed to be quick locations used in your Traveller games. Need a bar for a shady meeting in a hurry? Perhaps a desert outpost, a landing bay, starport concourse, or an ancient ruin? Hot Spots are designed to fill that need, featuring full color interior and exterior renders, scalable maps, notable NPcs, and adventure hooks to give the busy GM everything he or she needs to drop that location into their campaign. Hot Spots are compatible with all Traveller products, but setting neutral so that they can be dropped into any campaign. Background details are left vague enough so that each GM can fill them in with information that fits their game.